Global Homes Group's Real Estate AgentsSelling your home can be easy. Let our experienced staff help you make it happen. 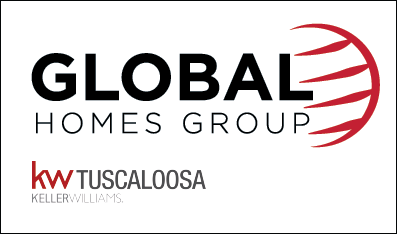 Global Homes Group is comprised of a team of local real estate professionals committed to selling some of the most desired homes in West Alabama. Selling these "right addresses" is the mission of Global Homes Group. Let us know what you're looking for. Please take advantage of the helpful tools on this website, including our exclusive West Alabama Real Estate search, but also feel free to contact us personally. Adam Beams is a lifelong resident of the Tuscaloosa area. He’s spent 18 years providing supreme care for patients with physical therapy. During this time, he and his wife Lori, discovered a passion for flipping houses and property development. In 2016, he decided to turn his joy into the business of helping people buy and sell real estate. In just the short time he’s been in the business, he has already made record sales and has reached the top 5% of agents within the Tuscaloosa Association of Realtors. His favorite aspect of real estate is negotiations. “I enjoy fighting to get the most for my clients and seeing their faces when they realize how hard I work to get every possible dollar for their properties. It’s the greatest job of all.” Together with his wife, Lori and two children, Brantley and Olivia. Adam is excited to partner with the big vision and the top notch values of Global Homes Group at Keller Williams. As a native of Tuscaloosa, Britt brings a lifelong knowledge of the market and the neighborhoods. He is married to Jenni, an interior designer, and they have one daughter, Marianne Mackenzie. Britt is passionate about helping people and building relationships, and his outgoing personality and attention to detail enable him to match each client with the house they are ready to call home. Originally from Peachtree City, GA, Heather Beth Lochridge is a lifelong ‘Bama fan that has called Tuscaloosa home for the past 20 years. Along with her love for real estate, she brings over 10 years’ experience as a Contract Specialist and several more in Property Management with the Global Homes Group. Heather Beth believes that listening to her clients’ needs is a crucial component in helping them and the dream home to match their lifestyle. Heather Beth and her husband attend Safe Haven Church – Big Sandy and live in Moundville, AL. Jeremy Dobbs is a four year, top producing real estate veteran. He’s a veteran because he’s sold more in only three years than a majority of agents sell in their career. He’s recognized as one of the top 10 producers in the Tuscaloosa Multiple listing Service and as one of the top Keller Williams agents out of 60+ Regional offices in the Southeast. But, he’s not your typical sales person. In fact, he’s the anti agent. Here’s why: • He listens, doesn’t talk. • He is organized with a plan, doesn’t fly by the seat of his pants. • He follows systems that gets more done in less time. • He’s a learner who is always seeking for ways to provide better service to clients. • He lets clients make their own decisions. No pressure or games. As a former athletic trainer for the women's basketball team at The University of Alabama, Jeremy learned what processes, systems, commitment and discipline can mean in the real world. These attributes along with his laid back attitude with NO DRAMA and no fancy manipulation training, Jeremy creates a no pressure, easy experience for both homebuyers and sellers. See for yourself. Schedule your initial consultation now. Luke Krieger is our man behind the scenes. He manages all the team's administrative projects to ensure our clients get the seamless service they deserve. From property marketing and promotion to contract to close, Luke handles the details. He's responsible, very responsive, and knows his stuff. A recent graduate of the University of Alabama, Luke has an B.S. in Accounting. Originally from Florence, Alabama, he and his wife Ashley have lived in Tuscaloosa since 2012. I have been a full time realtor for 23 years. Enjoying the process of helping both buyer's and seller's achieve their goals by providing them with current market information that is relevant to a successful transaction. Making sure that I have provided the level of knowledge, options and professionalism that is required to insure a positive and happy outcome.